This article is about the municipality in Attica. For the village in the Thessaloniki regional unit, see Nea Filadelfeia, Thessaloniki. 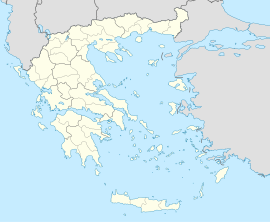 Nea Filadelfeia (Greek: Νέα Φιλαδέλφεια, meaning New Philadelphia) is a suburb of Athens, Greece. Since the 2011 local government reform it is part of the municipality Filadelfeia-Chalkidona, of which it is the seat and a municipal unit. The municipal unit has an area of 2.850 km2. It was named after the Anatolian city Filadelfeia, now Alaşehir in Turkey, and it was settled by Greek refugees from Asia Minor after the Greco-Turkish War (1919-1922). Nea Filadelfeia is a suburb of Athens, 6 km (4 mi) north of the city centre. Its built-up area is continuous with that of Athens and the surrounding suburbs Nea Chalkidona, Agioi Anargyroi, Acharnes, Metamorfosi and Nea Ionia. Motorway 1 (Athens - Thessaloniki) and Greek National Road 1 pass through the town. Nea Filadelfeia has a large park, Alsos Neas Filadelfias, which covers 0.48 square kilometres (0.19 sq mi). The park formerly hosted a large zoo. Nea Filadelfeia is roughly located at the geographical center of the Attica peninsula, around 13km from the sea to the south suburbs and at a low elevation. Nea Filadelfeia has 9 primary schools, 4 secondary schools (one of them is athletic type) and 3 high schools. Among them is the 3rd High School of Nea Filadelfia "Miltos Kountouras". Nea Filadelfeia is the historical home of A.E.K., a major Greek Multi-Sports Club established in 1924 in Nea Filadelfeia. It is also the home of Ionikos Nea Filadelfeia. The now demolished Nikos Goumas Stadium was the home ground of AEK F.C. from 1930 to 2003, while the Agia Sophia Stadium is expected to be the new home ground from 2020. The Ionikos Nea Filadelfeia sports club is renowned in Greece and abroad for its handball, volleyball and basketball achievements. According to the Köppen Climate Classification system, Nea Filadelfeia, like most of Athens, has a hot-summer Mediterranean climate, abbreviated "Csa" on climate maps. Winters are mild while summers can be particularly hot. Nea Filadelfeia is notorious in Greece for its summer heat; according to the Hellenic National Meteorological Service (H.N.M.S) it registers Greece's highest mean maximum summer temperatures for the period 1955-1997. On 26 June 2007, the H.N.M.S official climatological station of Nea Filadelfeia recorded 46.2 °C (115.2 °F), with the automatic H.N.M.S. weather station nearby recording 47.5 °C (117.5 °F) on the same day. For the 1989-2018 period, the mean maximum July temperature for Nea Filadelfeia stands at 34.8 °C (94.6 °F). ^ "Heatwave" (PDF). H.N.M.S. Archived from the original (PDF) on 1 November 2013. Retrieved 28 January 2018. ^ "Summer 2017" (PDF). H.N.M.S. Archived from the original (PDF) on 19 December 2017. Retrieved 28 January 2018. ^ "History of Nea Filadelfeia H.N.M.S station". Meteoclub. Retrieved 28 January 2018. ^ "30 year period summer statistics of Nea Filadelfeia". Meteoclub. Retrieved 28 January 2018. ^ "Climate: Nea Filadelfia, Attiki (Greece)". Retrieved 9 January 2019. This page was last edited on 1 April 2019, at 16:15 (UTC).